It's springtime and one of the things you can find at green-markets around looking lovely are big bunches of carrots. Maybe it's just me, but I feel like because carrots aren't trendy and tend to stick around longer than some other seasonal favorites, they often get overlooked for things like ramps. It's like baby got stuck in the corner, and it's not right. Sure, carrots are good for you and a workhorse for stocks, stews, and most slow winter cooking. But, the slender bright orange bunches of carrots you can find in the market now deserve to be the stars of a dish all their own. 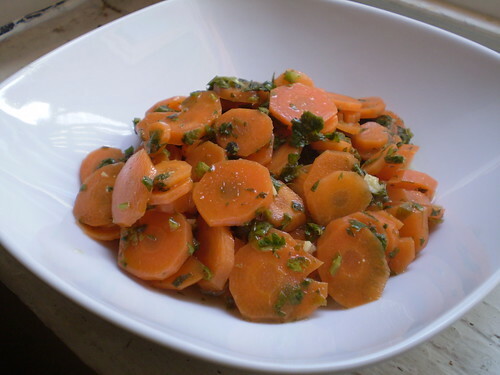 Carrot salads are a good start, but I find briefly cooking carrots really brings out their sweetness. The truth is, I don't really love raw carrots, and would choose a celery stick over a carrot stick any day. Sure cooked carrots are tasty slathered in butter, like most things, but I wanted something a little lighter than that. When I was little, my grandma always used to make us take notice if she put together a dinner plate with lots of different colors on it. Little did she know, her choice of different colored foods was actually a good way to measure how healthy dinner was that night. (Although from high school through college mac and cheese from the box was my orange colored food of choice). Orange foods are high in beta-carotene and vitamins A and C. Paying attention to the color of your foods is actually an easy way to make sure you're eating a well-balanced meal. Click here for more examples. I've been paying attention to different ways to prepare carrots to find more ways that would appeal to me, anything but that dreaded bag of mini carrot sticks that I can't seem to escape. Has every woman in the U.S. been brainwashed into thinking the only way to stay thin is to eat nothing but mini-carrots?! Ugh. I first made this cilantro salsa a few nights ago for some pork tacos that I was making. I was excited that it needed exactly the herbs I had growing in my windowboxes . This sauce is incredible. It would be perfect over any grilled meat or fish, and just the smell of it made me think that I would win over a lot of people if I served it that way. I immediately thought about all the things I envisioned myself doing with this sauce throughout the summer. Then I saw these carrots in the back of my fridge yesterday and I thought this sauce was so good I bet slathering carrots in it would work. I started by slicing the carrots very thin, thinking they'd taste even sweeter the thinner they were. I knew I didn't want to try grating them because grated carrot salads sometimes seem too weighted down with dressing for me, and a grated carrot salad is never as crunchy as a slaw. But these little coins retained their bite even after a brief dip in boiling water. I can't take credit for the pairing, because that is all Debra Madison's genius. I can only take credit for the fact that you now have no excuse to ignore the carrots at the market the next time you see them. 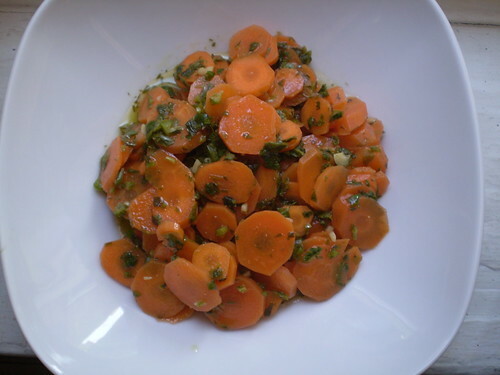 Carrot Coins in Cilantro Salsa Adapted from Debra Madison's Vegetarian Cooking for Everyone. This salsa is completely addictive and you'll find yourself wanting to put it on everything. If you like capers they'd be great tossed in here as well. Peel and slice 1lb. of carrots (or less depending on how many your feeding) into paper thin coins. The thinner they are the faster they'll cook. Toss in a pot of salted boiling water for about 5-10 minutes, or until fork tender. Remove and rinse in cold water to stop the cooking. Drain and toss with the cilantro salsa . Serve warm or chilled. Chop all the herbs and garlic very finely. Mix in lime juice, water and oil. Then stir in spice and season to taste.